It’s Adventureland meets Little Miss Sunshine, with this black comedy about a kid’s summer experience being pretty smart and interesting. This is a hell of a movie, dark and disturbing and yet also at times very funny. It’s a black comedy every step of the way, telling a story that is part the graduate, part Little Miss Sunshine, and part Adventureland. in that sense, It’s kind of got the best of all worlds. It’s about a depressed young man who is shunned by his family as well as by society, and yet he finds a way to escape from it all and discovers a group of people who respect and befriend him. the movie works for lots of reasons, including some terrific characters and wonderful casting choices. There are all kinds of reasons why The Way Way Back works. The story is fascinating and dark in all the right places. The characters are multi-dimensional and fun. And most of all, nearly every actor on screen here is hitting it out of the park and each in a very different way. The movie was written and directed by Jim rash and Nat axon, the team that wrote the descendents, another dark comedy. This one has it beat. That movie felt too dark at times, being about a mother’s death and the grieving process. This one never reaches those levels. Instead, it’s about a boy’s summer experience going away to a beach town with his mom and her new boyfriend. Once there, he meets a whole group of people and enters into a different kind of world. The title of the movie refers to the backseat of an old Volkswagen, which faces the opposite way of every other seat in the car. This seat is in the way, way back of the Volkswagen, further back than anything or anyone else in the car. It’s also a metaphor, of course, for a boy who feels like he is in the way, way back of everyone else around him, on a different playing field. This kid has no confidence and doesn’t have the kind of support team around him to do anything about it. The movie introduces him to a place where he can figure things out for himself. At the start of the movie, this boy named Duncan is sitting in the back of the Volkswagen, having a conversation with the driver, Trent (Steve Carell.) Trent is the new boyfriend of Duncan’s mom, and he is driving Duncan up to the summer beach house where they will be meeting his mom and staying for about two months. It’s during this opening conversation that Trent asks Duncan what the boy thinks of himself, on a scale from 1 to 10, and then insults Duncan, calling him a 3. We learn pretty quickly from scenes like this that Trent is a jerk. He thinks the way to transform Duncan into being someone who is more socially acceptable is to belittle and be meaning to the boy. Duncan’s mom, Pam (Toni Collette), is too swept up with Trent to see the way that he treats her son. Even when Trent starts acting certain ways to her, Pam is afraid to do anything about it, for fear of losing him and being alone again. For both carrel and Collette, these are very different roles for them. Steve Carrel, in particular, plays a terrific villain here, never crossing the line of becoming too evil or a cliché, but instead being believable and sly at all times. And for Toni Collette, this is a very low-key role, as a woman who is too shy and afraid to lash out and stick up for herself or for her son. She’s a wonderful actress, and has pretty much done it all since she broke out in Muriel’s wedding. Her role here is a little more like what she played in the sixth sense, quiet and reserved, yet definitely building up a lot inside. And then there are the characters that Duncan meets when they arrive in town. There’s the crazy neighbor, played by Allison Jamey in a role she is just perfect for. Jenny’s character, Betty, is an alcoholic who has no shame in front of her kids and tells them the truth or her perception of the truth, about everything. She has one son who has a wandering eye, and she makes the boy wear an eye-patch everywhere because she says the wandering eye makes people uncomfortable. Meanwhile, the wandering eye is barely even noticeable. The real heart of the story takes place at a water park where Duncan starts sneaking out to and spending his days. Duncan befriends the people on staff there, and then gets a job working at the park himself. These are some of the most fun characters in the movie. There’s Owen, who becomes Duncan’s best friend, played by Sam Rockwell. Then there’s his boss Caitlin, who constantly has flirty banter with Owen, played by Maya Rudolph. 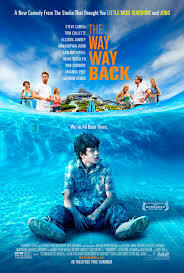 These are the nice, funny characters of the movie and they provide a very different experience for Duncan than what he is getting back at the beach house with his mom and Trent. While the movie is from the people who made the descendents, the cast here is straight out of two other black comedies. Little miss sunshine and away we go. Steve carrel and Toni Collette are from Little Miss Sunshine and Maya Rudolph and Allison are from away we go. It’s as if Jim rash and Nat axon loved those two movies and hand picked there cast in order to combine the two films together. There’s no question about it, the casting is one of the major reasons why this movie works so well. The other reason is the writing and way that the story moves. While there might be familiar storylines (a major character has an affair), nothing ends the way you would expect, and that really makes a difference in keeping this movie out of the usual territory. Too many movies feel that they have to go the same route as others, which came before them, in order to affirm that their movie is not too crazy or awful. The best movie, of course, goes the opposite route, and wants to be something different. The Way Way Back is one of those. It’s a great movie filled with emotion and clever ideas.